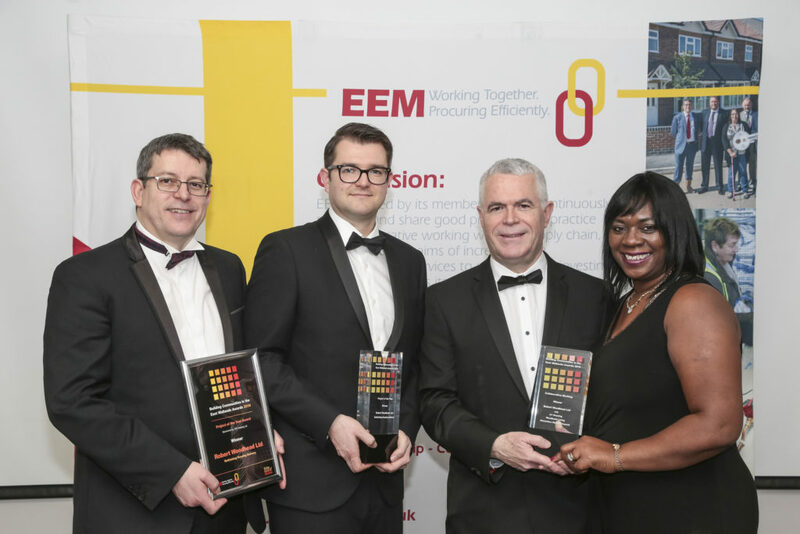 For the second year running the Building Communities in the East Midlands (BCEM) Awards hosted nearly 400 representatives from the world of housing and construction on Friday 12 February to celebrate the region’s successes. The awards, held at East Midlands Conference Centre, was hosted by regional procurement consortium, EEM Ltd. The not-for-profit organisation works with 56 housing providers and public sector bodies to help make efficiency savings on asset management and maintenance work programmes across the country. Collaborative Working Award – handed to Woodhead Living, alongside client partners, A1 Housing and Bassetlaw District Council, for the successful partnership work in delivering the first 71 council homes in Harworth for more than 35 years. Corporate Responsibility Award – awarded to Woodhead Living for its work alongside Nottingham City Council, Nottingham City Homes and social enterprise sub-contractor, BestBuild UK, for its innovative approach to delivering a community-focused sustainable housing project at Denton Green in Broxtowe, Nottingham. Innovation Award – handed to Woodhead Group for its innovative work on their Good to Gold Programme, a flexible construction leadership development programme tailored for our supply chain and designed to help them learn, improve and grow their businesses. Project of the Year Award – given to Woodhead Living for their “Rethinking Housing Delivery programme” alongside client partners, A1 Housing and Bassetlaw District Council, for their forward thinking approach to procuring programmes of work to deliver efficiencies in new build housing. Event host, EEM, works with hundreds of contractors on its frameworks, offering free membership to any public sector organisation looking to make savings on asset management schemes. Chief Executive, Pete Smith, said: “Last year’s inaugural event was a fantastic way to celebrate the work done by housing organisations and construction firms across the region. The event was a huge success and all the winners and runners-up were a glowing example of just what can be achieved in the communities we work in. Don Spittlehouse, Managing Director at A1 Housing said: “We were delighted to win the Project of the Year Award with our partners at Bassetlaw District Council and Woodhead Living. This is testament to the excellent relationship that has been fostered between the partners and recognises how we have been able to achieve the best possible specification for our budget. By achieving such great value for money we have been able to maximise the benefits and impact of the project for the community.”Nottinghamshire construction company, Woodhead, is celebrating after winning all four of its categories at this year’s Building Communities in the East Midlands Awards. EEM’s chosen charity for this year is Little Hearts Matter, the national charity supporting children born with a single ventricle heart condition, commonly called ‘half a heart’. This condition is the severest of all heart conditions and twenty years ago most children would have died within days of being born. Thankfully today there is life-saving surgery available for many of these children. Little Hearts Matter provides support from initial diagnosis right the way through to the help families need with gaining independence, as well as bereavement support should the worst happen. EEM and a number of other sponsors donated a wide range of raffle and auction prizes for Friday night’s event, raising a total of £20,000 for Little Hearts Matter. Last year’s awards raised £10,000 for EEM’s chosen charity, Steps Conductive Education, as well as surprising the Shepshed-based charity on the night with a refurbishment of the windows in its historical building. Thanks to support from EEM contractors, Nationwide Windows, HLP Design and Robert Woodhead Ltd, the work has been completed and the charity is now benefiting from a much warmer, more secure centre, which is cheaper to run.